We have all heard that breakfast is the most important meal of the day, but do you know why that’s the case? Breakfast is the first meal that the body has for fuel after “fasting” all night, so it “breaks” your “fast” – breakfast. Eating breakfast helps us to maintain a healthy blood sugar level, which is important for maintaining our overall health. However, what we eat for breakfast is very important. Eating sweets and low-fiber carbohydrates will lead to insulin resistance. Insulin resistance is often a precursor to heart disease and diabetes. So breakfasts consisting of donuts, pancakes, waffles, sweet rolls, etc. are not a healthy way to start your day. These cause your blood sugar to spike up, then crash down, making for a very long day! The best foods for breakfast include healthy fats, high fiber carbohydrates and protein. 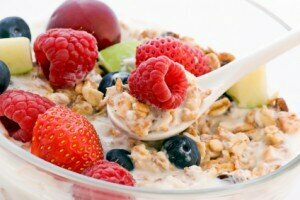 Some examples are organic eggs, high fiber, whole grain toast, fruit, nuts, seeds or plain yogurt. Even if you don’t have time for what you may “breakfast” – eggs, toast, etc. – you can still make a healthy shake of fruit, unsweetened plain yogurt, water, ground flax seed, and fresh or frozen berries. You can sweeten the shake with Stevia if the natural sweetness of the berries is not enough. So tomorrow, make sure you start your day with a healthy breakfast and see the difference it makes in your energy level!